The powerful Toyota Tundra is a full-size pickup that can do it all – hauling, towing and cruising in style. When people see the fearless Tundra coming down the road, they can see it’s all business. What’s more, it’s designed in Michigan and California, and assembled in San Antonio, TX, to cater to America’s demanding drivers. 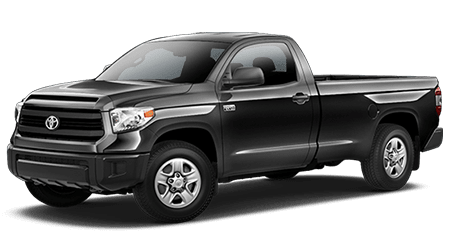 Please check out the 2016 Tundra at Vann York Toyota, the premiere car and truck dealership in High Point, NC, and one of the easiest places you’ll find to strike a great deal on America’s workhorse, the Toyota Tundra. Our new digs at 500 Eastchester Drive in High Point will wow you with the latest in consumer comfort and customer service. We’ve been helping put people into Toyota’s for many years, and you’ve probably seen our happy customers tooling around Greensboro, Winston-Salem, Kernersville, Jamestown, Thomasville, Lexington, Asheboro, and Burlington, NC, with big grins on their faces. We treat our customers like family, and we put ourselves in your shoes for exemplary customer service and dependable follow-up service. The Tundra has a solid reputation – and so does Vann York Toyota. You’ve never seen a pickup truck interior like the awesome new Tundra’s cozy cabin. Look around at the finely stitched seats, fit for a king. Gaze at the crisp, bright gauges and appointments, and at the center stack that puts everything you could think of at the driver’s fingertips. You’re in heaven. The Tundra CrewMax model takes it up a notch with a moonroof and power sliding rear window. You get all the amenities of a luxury vehicle in a tough-as-nails full size pickup. Some of us spend a lot of time in our pickups – no names mentioned – so Toyota has made the Tundra’s cabin so comfortable it truly becomes your home away from home. Consider the optional dual zone automatic climate control with separate temperature setting for the driver and front passenger. For the ultimate in capability and creature comforts, the Tundra Limited CrewMax edition weighs in with world-class extras like leather-trimmed heated front seats and telescopic steering wheel. Whether you’re moving a boat or a heavy payload of home furnishings, Tundra takes you through the paces smoothly. When you come to a stop, Toyota’s Integrated Trailer Brake Controller makes sure your trailer does too. It’s one more way the iconic Tundra is becoming smarter and smarter. And stronger. The 2016 Tundra can tow 10,000 lbs without breaking a sweat, and the TOW/HAUL Mode increases throttle response and changes gears more efficiently so you can tow like an AAA professional. You can thank the intrepid 5.7L V8 engine for that. Using staggered outboard shocks for more stability, the heart of Tundra’s toughness is a heavy-duty C-channel frame. When we say heavy-duty, we don’t use that term lightly. Tundra shares the same frame as construction site dump trucks. It harnesses all that towing power with an available trailer hitch secured to the frame rail with 12 bolts. After all you’ve read and heard about the dependable Tundra, isn’t it time to test drive one yourself? You’ll find it easy to forget you’re driving one of the most hard-working pickup trucks money can buy, once you she how well it handles in traffic. Come one, come all to Vann York Toyota’s swanky showroom at 500 Eastchester Drive in the heart of High Point, NC, central to Greensboro, Winston-Salem, Kernersville, Jamestown, Thomasville, Lexington, Asheboro, and Burlington. The friendly folks at Vann York Toyota are eager to show off the fearsome Toyota Tundra. But please don’t kick the tires on the Tundra – they might just kick you back!